American Beauty: Skinner’s American Furniture & Decorative Arts auction on March 4 promises depth, breadth and surprises | Skinner Inc.
BOSTON, MA – Skinner Inc.’s upcoming auction of American Furniture & Decorative Arts features over 500 lots, ranging from classic New England case pieces and seating furniture to exceptional ceramics, fine scrimshaw, and very desirable folk paintings. The auction will take place at the Boston Gallery, 63 Park Plaza, on March 4 at 10AM. Previews will be held on March 2, 12PM to 5PM and March 3, 12PM to 8PM. Stephen Fletcher, Director of American Furniture & Decorative Arts, emphasizes that this auction offers not only rarities for the advanced collector but opportunities for new bidders to acquire “great pieces” that have been given modest estimates to encourage buyers to step into this vibrant market. Adding to their appeal, many of the offerings are fresh to the market, with many lots coming from several private collections. The auction opens with mocha and dipped wares from the collection of Jonathan Rickard, premier collector, and author of the definitive book, Mocha and Related Dipped Wares: 1770–1939. Also featured is furniture and decorative objects from the Lucius D. Potter Memorial Collection at Historic Deerfield, mostly acquired in the first half of the 20th century and bequeathed to the museum over 50 years ago. Another important specialized collection is of nautical antiques featuring extraordinary canes and scrimshaw from the estate of a Cape Cod collector. The auction begins with 27 lots of pearlware and creamware, most of it with characteristic mocha decoration, often abstract and geometric. Many of the lots offered have been exhibited in museums. Chris Fox, Associate Deputy Director of American Furniture & Decorative Arts, notes that the lively patterns and functional shapes of these ceramics have enduring appeal and harmonize with every style from colonial to post-modern. Lot 7, a mocha-decorated pearlware jug (Estimated between $400-600) offers excellent form, decoration, and color. The furniture on offer is especially strong in Massachusetts tables, chairs, and mirrors from the “golden age” of New England cabinetry. Stephen Fletcher points out that now is a superb time to acquire these time-tested pieces, at prices more favorable than they have been in years. 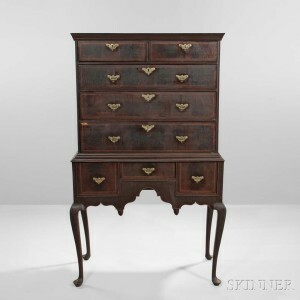 Lot 28, a mahogany block-front chest of drawers from Massachusetts, circa 1760-1780 ($6,000-8,000), with claw-and-ball feet, is particularly beautiful. 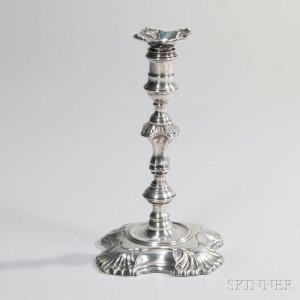 ♦ Small tables and candlestands, dating from the last half of the 18th century to the early 19th century, versatile forms that are useful as well as space-saving. ♦ A multitude of chairs, including Queen Anne, Chippendale, and Federal style. Highlighted by carved mahogany shield-back side chairs, Rhode Island, c. 1795 (Lot 273, $1,500-2,500). ♦ Chippendale-style walnut mirrors. Lot 34 is a late 18th-century exuberant example with fine gilt gesso decoration ($800-1,200). The marine section of the auction features some of the most anticipated lots, with important scrimshaw and several significant ship’s portraits. 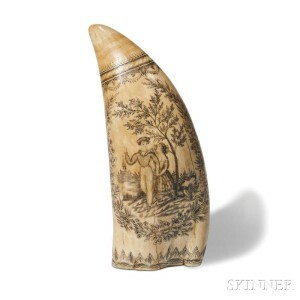 A scrimshaw whale’s tooth depicting the “Frances” of New Bedford (Lot 116, $100,000-150,000) is one of only two known depictions of this whaling vessel (the only other “Frances” tooth was also sold by Skinner). 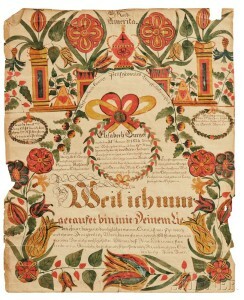 The detail, clarity, and precision of the decoration put this example in a class of its own. It is the work of Frederick Myrick of Nantucket, a legendary scrimshander best known for his “Susan” teeth, of which 30 have reportedly survived. Many other significant examples of scrimshaw are offered in this auction. Stuart M. Frank, a noted expert and author of Ingenious Contrivances, Curiously Carved: Scrimshaw in the New Bedford Whaling Museum, will be delivering a talk in Skinner’s Boston gallery, “The Hallowed Halls of Scrimshaw,” on Friday, March 3 at 6PM. Another important piece of marine art is an oil painting by French maritime artist M. Renault. Depicting the ship Houghton of Bath, Maine, entering Leghorn harbor in 1862, the scene is unusual for its fine detail and the large number of vessels it accurately depicts in the busy Italian port (Lot 170, $8,000-12,000). ♦ Lot 357, a pine fireboard exuberantly painted with a pair of floral urns framed by vines, is probably by the same itinerant artist who created a similar fireboard formerly in the collection of Nina Fletcher Little and now at the Art Institute of Chicago ($30,000-50,000). ♦ Lots 359 and 350 are colorful, complex frakturs painted for a mother and daughter by the same artist, probably George Gottfried Ephraim Burger ($6,000-8,000 each). ♦ Lot 412, an album of pen-and-ink and watercolor drawings and ephemera, mostly relating to a small town in Minnesota circa 1870. The finely detailed images are a lively record of landscapes, interiors, and exteriors in a thriving rural community ($800-1,200). Stephen Fletcher advises “Pay attention to all auctions. There’s always an opportunity to buy something special.” A large and varied sale such as this one offers depth and breadth in each category: for example, over two dozen gentleman’s canes in whalebone, rosewood and mahogany, ebony and Malacca (Estimates vary, $100-3,000). Auction previews are free and open to the public. They will be held in Skinner’s Boston gallery, 63 Park Plaza, on Thursday, March 2, 12PM-5PM; Friday, March 2, 12PM-8PM. The print catalog is available for purchase from the Subscriptions Department at subscriptions@skinnerinc.com. Prices realized will be available at www.skinnerinc.com during and after the sale. The Skinner website enables users to view all lots in the auction, leave bids, and bid live, in real-time through SkinnerLive! This entry was posted in News and tagged American, Americana, antiques, artwork, auction, boston, carving, chippendale, decorative arts, Delaware, federal, folk art, Frederick Myrick, furniture, maine, marine art, Maryland, massachusetts, needlework, painting, patriotic, Pennsylvania, portrait, pottery, Queen Anne, rhode island, scrimshaw, silver, Stephen Fletcher, weathervane, wrought iron by Skinner. Bookmark the permalink.